This week’s #MarkerMonday highlights Oglethorpe’s unique friendship with the chief of the Yamacraw Indians, Tomochichi. Tomochichi’s friendship was indispensable to the establishment of the Colony as a military outpost against Spanish invasion. While little is known about his youth, in about 1728, Tomochichi established the Yamacraw Tribe. The tribe formed from disbanded members of Creek and Yamasee Indians following a disagreement between the two Indian nations over the future of relations with the English and Spanish in North America. 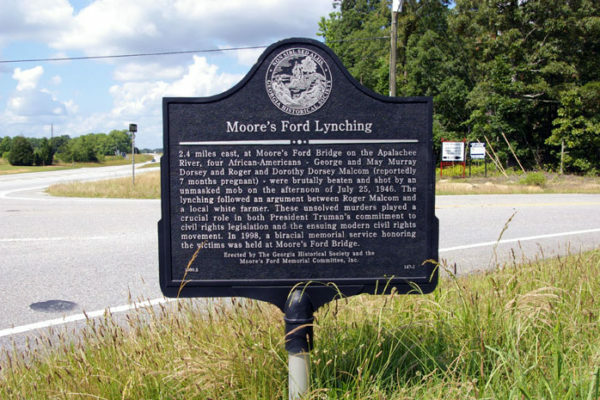 Tomochichi met General James Oglethorpe and Creek translator Mary Musgrove in 1733. 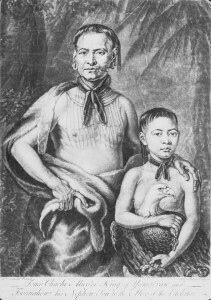 Tomochichi and Toahahwi, 1739. From the Foltz Photography Studio Photographs, MS 1360. 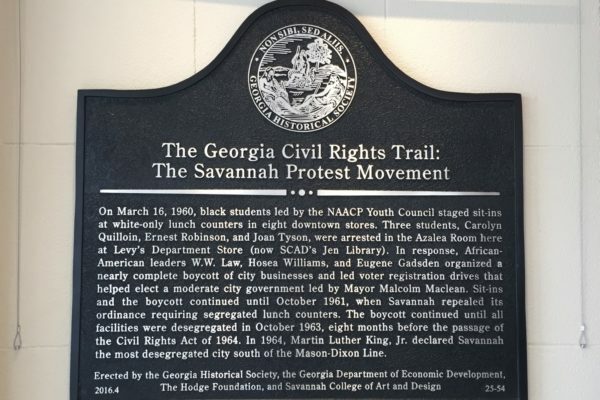 At this meeting, Tomochichi and Oglethorpe crafted an agreement that allowed the establishment of Savannah and allowed Tomochichi to benefit from trade with the colonists. In 1734, he and a group of Yamacraws accompanied Oglethorpe to England to make their requests for education and fair trade deals directly to the Georgia Trustees and King George II. 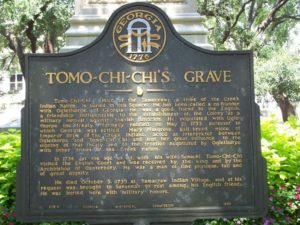 After his successful six-month visit to England, Tomochichi returned to Georgia and convinced many Lower Creek Chieftains to ally themselves with the English. In the years that followed, he oversaw the development of an Indian school with Benjamin Ingham, a friend of John and Charles Wesley. Tomochichi continued to work with Oglethorpe, mediating interactions with the Spanish and participating in an expedition to determine the southern boundary of Georgia in 1736. 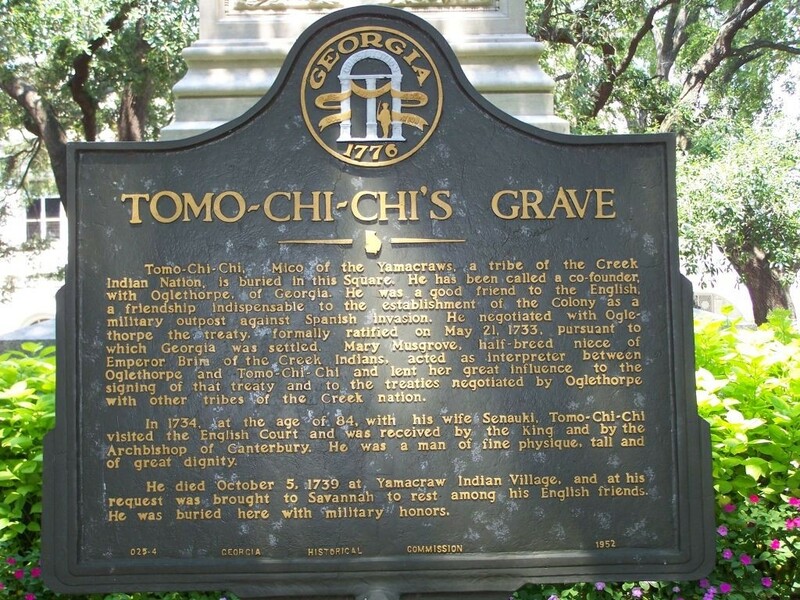 Tomochichi died October 5, 1739 at the Yamacraw Indian village, and at his request was brought to Savannah to be laid to rest. He was buried with English military honors. 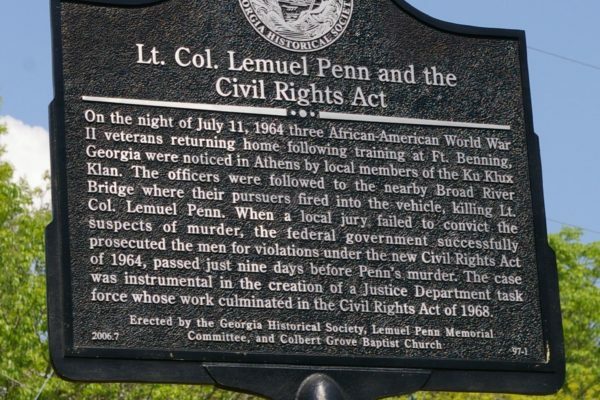 Explore the links below to learn more about James Oglethorpe and Tomochichi. GHS is proud to house a significant collection of materials related to Tomochichi and James Edward Oglethorpe and Georgia’s colonial history that can be found by searching the GHS’ online catalog. James Oglethorpe is one of GHS’ Featured Historical Figure for the 2016-2017 Georgia History Festival. Check out GHS’ online learning materials. The GHS website also features additional content about Tomochichi.